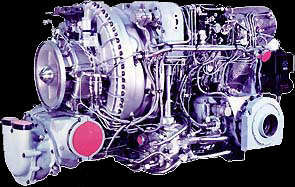 GTD-1250 gas turbine is the main powerplant of a T-80U MBT. It is a development of GTD-1000T and GTD-1000TF engines that were installed on the previous tanks of T-80 line. The engines are developed by NPO im. Klimova Enterprise. The engine is implemented in a triple-shaft scheme, with two independent turbocompressors and a free propulsion turbine with the built-in conicocylindrical reducer, and is kinematically connected to two planetary gear boxes. The engine monoblock comprises the engine, the air filter, oil tanks, engine and transmission radiators, fuel filters, and the driving gear components. The monoblock is attached to the hull in three points, two stirrups in the rear and one roof-attached support in the front. The turbine has an adjustable nozzle system that provides for tank's braking with the engine, reduces turbine's rotation speed and prevents its overrunning when the gears are changed. The engine can use jet fuels as well as diesel and low-octane gazoline fuel. The engine's startup is automated by means of two electric motors fed by accumulators or GTA-18 auxiliary power unit. The engine has good dynamic stability, service life, and reliability. It has built-in automatic systems of dust deposits removal. The latest engine, GTD-1250G, also features the hydrovolume turning mechanism that on a twisting route reduces the fuel consumption by 9% while increasing the average speed by 29%. Officially the gas turbine engines have lost the competition with the diesels and have no future in the Russian Armored Forces, though it is unclear whether this is due to the real drawbacks of the engine (like bigger price, substantially greater fuel consumption and smaller service life compared to the diesels) or the competition between the plants. It is worth noting that the work on the GTD line of engines continues and therefore their return to grace is not inconceivable.